首先,那几个段落是我在网上摘的,这个我不会否认的,但我并不是摘自你的那个blog,而是在中文google搜索时搜索出来的很多网站里摘的个别觉得对文章有用句子.比如这个网站: http://bbs.nau.edu.cn/thread-72319-1-1.html 当时那个电影我没有找到片源,没有看过,没有办法自己写,英文介绍的资料也不多，我翻译了一些发现不够一篇整篇文章，我就去网上找了些中文资料补充了,我哪知道其中的部分文章是来自你的blog哦~我今天看到你发的你的blog的文章也吓一跳哦! 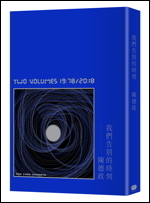 只要滚石给我提供原刊或者英文资料，我一般不会去找中文资料,尤其是写电影的,如果自己没有看过,想自己写出来比较难. 我做编辑6年了,这样的事还是第一次发生,我想让你知道我不是恶意抄袭别人的文章,对此对你产生的不快我很抱歉哦!对不起!! 自己不能瞎编没看过的电影，只能翻译英文，在英文资料不足的情况，我会借鉴中文.我是这个意思.old joy我是没看过,但不代表我所有影评都是没看过就先写啊,呵呵.大陆文化什么样我可不敢乱说的,都，没那权威哦，呵呵. 和這種下三瀾的痞子對槓真有夠衰,因為不是對手所以連架都吵不起來。想用文明的方式訓他也超沒成就感的因為HE JUST DOESN'T GET IT!!! 沒力。我想這時說破理也及不上呼也兩巴,踹他的三腳或說他八代趕羚羊來得有效。可限於家教有時只能在午夜夢回時在心理想上個百回或幹上數十兩句以助心理衛生。節哀啊學弟。hey, i think you are entitled to his paycheck. may be you dont really care but fighting for this may be more practical. Discrimination is not a good word or a wise method. 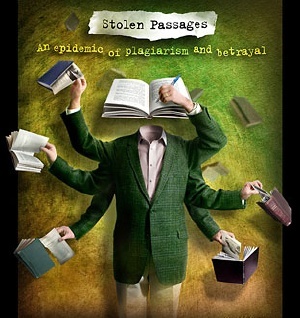 撇開社會道德正義, 就如版主的subject所言 -> plagiarisum is a crime. 我看了覺得很憤怒的原因是盜竊者的狡辯, 好像把對方當成白痴一樣耍, 還強詞奪理, 做錯事不就應該當面認錯嗎? 但自己矛盾的是, 我也一直用BT下載音樂, 電影, 用盜版的軟體; 若我不通過這種途徑去下載, 我就無法得到這些自己喜歡的東西, 是買不到, 也是賣不起, 所以究竟我應該立即停止下載, 斷絕接受另類音樂和冷門的電影, 還是繼續盜盜盜? Let’s see. 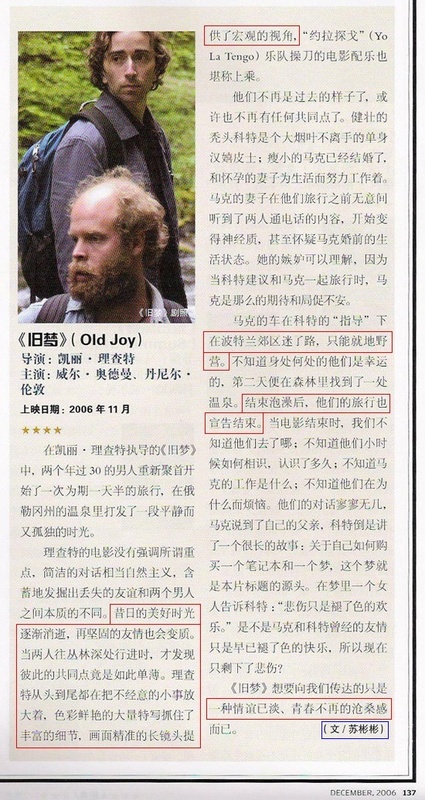 Here is a ‘virtual’ movie review, written for a magazine few would bother to read (if what I read here is true), about a movie even fewer people would have a chance to watch. I know I know, someone has to be on the ‘cutting edge’, but this is a farce. What is more pathetic? Someone makes a living by gathering other’s work and pretending it is her own, or the cynics out there saying just get use to it, as this is the rule of the jungle? I give my one finger salute to the perpetrator. There is one less fraud we have to deal with, in a world that has plenty in supply. But nothing much is going to change, if there is not an outcry over this. Whether she did this with the editor’s knowledge is another matter. It will be interesting to watch what RS does next. Heads rolled at New York Times over the case of Jayson Blair, if I remember it right. Oops, too farfetched. Until people learned to speak out in the land of the masses, there wouldn’t be any pressure to make real changes. Still more people get fucked everyday. 抱歉, 我來認罪. 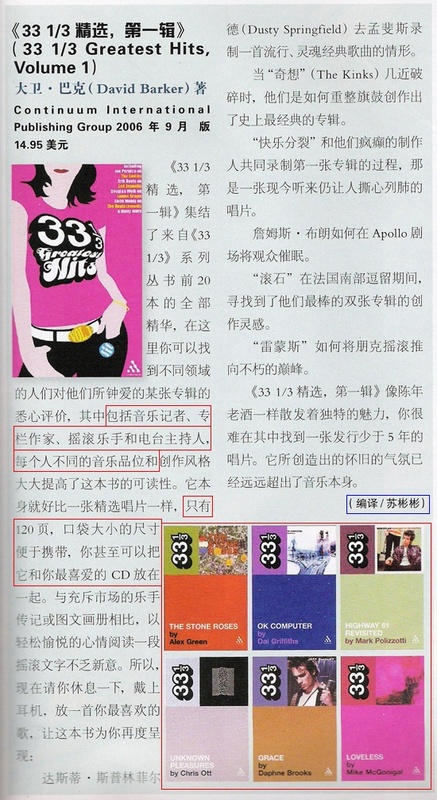 當初我是在您Juicy Mix 2006這篇上面看到有可以轉載的資訊所以把歌單跟撥放器放到我的blog. 本意只是想讓我的朋友聽到這些比較不長聽到的音樂跟資訊. 不知道造成你的困擾. 我先拿掉, 如果您覺得ok可以放的話, 麻煩再請來信跟我說一聲. That's it,that's all it is. HE IS NOT GOD ANYMORE,BUT AS EVER,ERIC CLAPTON ROCKS,ROLLS AND RULES. 網路MP3下載一直有個灰色地帶,但在INDIE的世界是不可或缺的媒介,最近看到的例子是The Shines的新專輯"Wincing the Night Away"在首周以11萬8千張登上全美專輯榜第二,我沒聽過也沒下載過The Shines的音樂,不過當我知道他們是indie團時,我很開心,indie大勝利,聽過MP3後而買專輯的人大有人在. anyway pulp you are right, "copycat is a sin!"